For the record, I am not neglecting you all. Rather, holiday orders are keeping me busy… morning, noon, night… midnight too! But I didn’t want y’all to have to cry another day, since I’m sure that’s what you do when I don’t post something new. I’m always looking for fun, yet simple gifts for neighbors, co-workers and hostesses. And, for me, presentation is 75% of the gift (I get it from my mom). So, I love this gift idea. 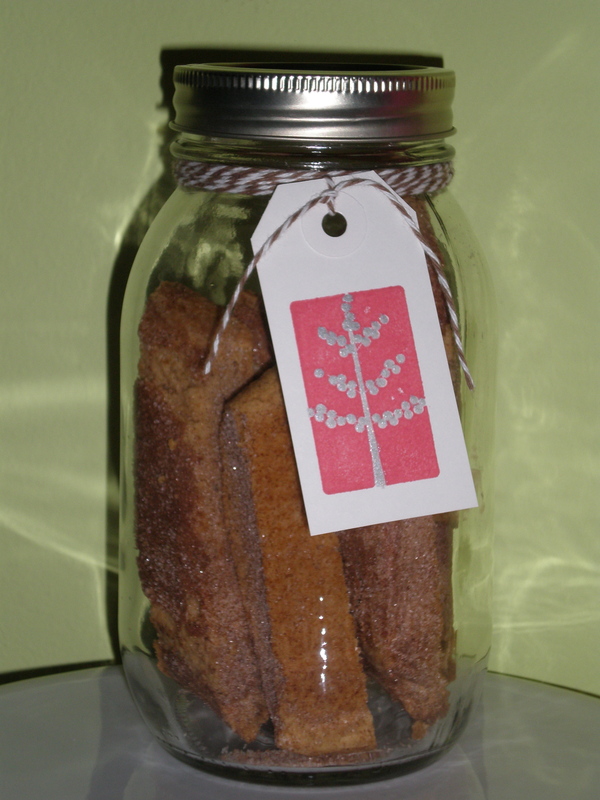 I simply took pieces of cinnamon sugar biscotti and placed them in a mason jar (which are very inexpensive and can be found at any large box store). I then wrapped baker’s twine around the top – you could use raffia, ribbon or even cord – and added a simple gift tag. Clean and simple and such a great gift. Of course, wine is alway a good option. Oh, what about wine and some biscotti!